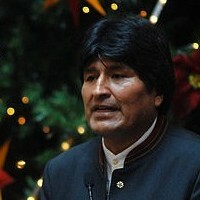 Juan Evo Morales Ayma, popularly known as Evo, is a Bolivian politician and activist, serving as the 80th President of Bolivia, a position that he has held since 2006. He is also the leader of both the Movement for Socialism party (MAS) and the cocalero trade union and is widely celebrated as an advocate for social justice. Politically a socialist, his presidency has seen a focus on implementing leftist policies in the country, introducing a new constitution, land reforms, nationalizing various key industries and opposing the United States’ and corporate involvement in the country's politics. Born into a working class Aymara family in Isallawi, Orinoca Canton, Evo grew up aiding his parents as a subsistence farmer. After studying for a degree, he undertook national service until 1978, when he returned to the family profession of farming, moving with them to Chapare Province. He eventually settled into growing coca, becoming actively involved in the coca growers' trade union, the cocalero movement. Becoming a well-known activist amongst the campesinos (rural laborers), he was known for leading the resistance against the U.S. government's attempts to eradicate coca as a part of their wider "War on Drugs". His activism led him into the political arena, and he eventually became the leader of the MAS, through which he got involved in social protests like the gas conflict and the Cochabamba protests of 2000. The MAS aimed at giving more power to the country's indigenous and poor communities by means of land reforms and redistribution of gas wealth, and gradually increased its electoral support. A critic of the United States' foreign policy and the involvement of transnational corporations in Latin America, he has been a firm ally of the socialist governments of Hugo Chávez in Venezuela and Fidel Castro in Cuba. In October 2009, Morales was named "World Hero of Mother Earth" by the General Assembly of the United Nations.